This is a piece of jewelry FIRST. The solid 18k. 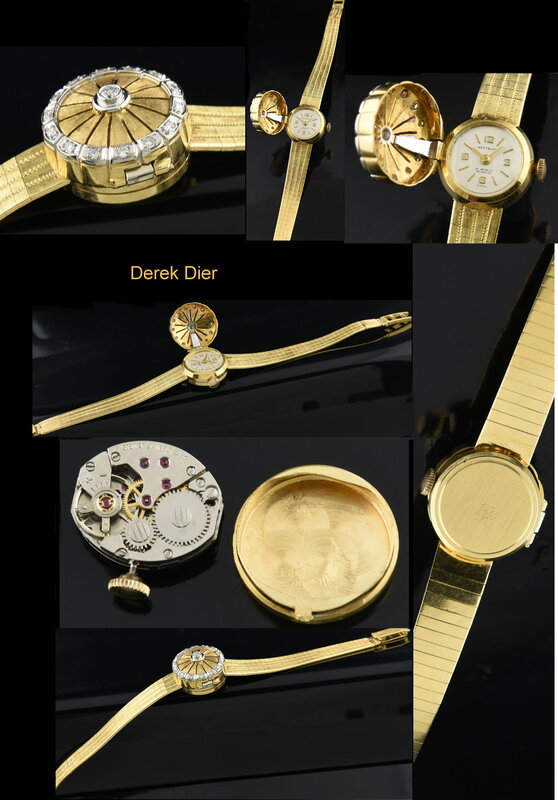 gold head of the watch measures 18.5mm and is encrusted with diamonds. This is a flip-top, and when opened displays a manual winding WESTBURY 1960’s vintage watch which is attached to a solid 18k. gold integrated bracelet. The entire watch weighs 25.5 grams. The manual winding movement is keeping accurate time. This vintage watch is exquisite and sits 10mm. high on the wrist, glittering with authentic diamonds. It’s dainty “cocktail” size is not over-bearing on the wrist. This watch will fit a 6.25 inch wrist. Stunning! $1750.